TERRE HAUTE, Ind. - More than 700 Indiana State University students, faculty and staff streamed into the Student Recreation Center Monday to get their first glimpse of the facility. "We wanted to allow members of campus to view the building as soon as we could safely do so," said Tom Ramey, vice president for student affairs. "It's important the students get a feel for the facility that they wanted and helped design." The 109,420 square-foot facility designed by Hastings+Chivetta Architects of St. Louis, houses a three-court gymnasium, an aquatics facility, fitness center, elevated jogging/running track, healthy snack bar, multi-purpose activity rooms, an outdoor adventures equipment center, a multi-activity court, locker facilities, and offices. Visitors were able to step into areas that in the near future will offer expanded intramural sports, space for open/unscheduled play, fitness and exercise training, lifestyle/wellness education, aquatic activities, outdoor adventures and a social space. "This facility addresses the recreational needs of students. It's their place to use on their time," John Lentz, director of recreational sports, said. Graduate student Tressman Goode has seen the project come full circle. He was an undergraduate student serving in the Student Government Association during the project's early beginnings. "At first, during the referendum, I was against the project," he said. "But I supported the students' right to vote on it." The students voted and put the wheels of progress in motion. That changed Goode's view. "Now, seeing the building near its completion, I think it was one of the best decisions the University has made," he said. "This facility will allow current and future students to participate in recreational activities in a spacious, relaxing, state-of-the-art facility." 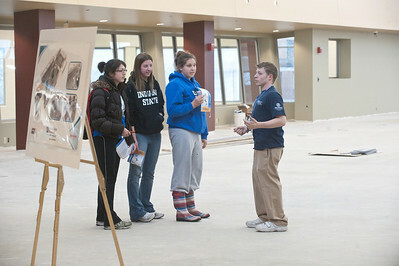 As students toured the facility, they were noting where they will spend their time. "I want to go swimming," said Regina Atkins, a liberal studies major from Indianapolis. "But I'll force myself to use the fitness equipment and the walking track." Atkins feels the student fee funding the facility is money well spent. "It's worth the fee to be able to use a facility like this," she added. As junior Colin Hammar toured the facility, he was taken with the openness and natural light flooding in from the large windows of the fitness center. "It's really a nice atmosphere," he said, adding he liked the elevated track. "I run a lot," Hammar, a music major from Indianapolis, said. "It will be nice to run indoors when the weather is bad and not on a treadmill." Building a sense of community is exactly what Student Government Association President Michael Scott hopes will happen at the Rec Center. "I sincerely believe that the Rec Center will become the new mecca or hub for students on campus," Scott said. "Not only will it provide recreational activities, but it will also offer an opportunity for students to interact with friends and make new ones." According to Ramey, graduating students will be allowed to use the facility. "For each semester they paid the fee prior to the building opening, they will be eligible for a semester of free use following graduation," Ramey said. For those counting down to commencement, that is welcome news. "It is extremely important for students who will be graduating to have the opportunity to use the facility," Goode said. "These students have had the opportunity to fund the creation of an amazing facility and now they will have the chance to experience what they helped build." Goode, who will graduate in May, is planning to take the University up on its offer. "I hope to take advantage of the Rec Center is during Homecoming each fall," he said. As a proud Sycamore, I know when I return back to campus I have a place I can go and relax unlike anything before on this campus." A dedication ceremony is being planned for July 10, which will officially open the Center. Recreational Sports staff are planning a week of activities when students return in August, called "Rec Fest," Lentz said. The Center, located east of Lincoln Quad and accessible from Tippecanoe Street, will enable Indiana State to promoting healthy collegiate lifestyles, encourage a life-long commitment to fitness, introduce new recreational formats and enhance the sense of community on campus. The cost of the Student Recreation Center is $21.7 million, funded through student fees and private gifts. Jim and Diane Wittenauer, two donors to the facility, took advantage of the opportunity to catch a glimpse of the newest addition to campus. The facility is close to the heart of Jim Wittenauer, who served as a director of recreational sports and professor of physical education until his retirement in 2000. "I don't have words to describe the facility," he said. "It's fabulous. It's something the University has needed for a long time. Now it's almost a dream come true." More than 700 Indiana State University students, faculty and staff streamed into the Student Recreation Center Monday to get their first glimpse of the facility.